Hello! I am a 39 year-old French teacher. My pupils are aged between 11 and 15. I teach near Switzerland in a small school. 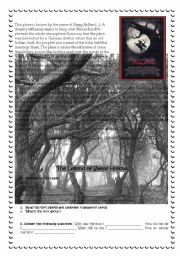 A worksheet to help pupils watch and understand the issue raised by Moore´s film. Several extracts analysed. 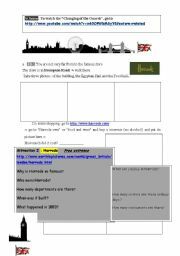 In this worksheet, pupils will discover this great and exciting city: go to the restaurant and order a meal, visit major monuments and anwser questions about them etc. You can either use the web, or dictionaries and encyclopedia. 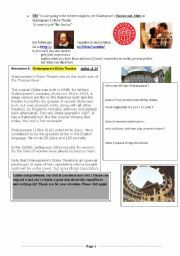 Worksheet in 3 parts about a one-day visit of London: discover this wonderful city, get familiar with some major places, go to the theatre and to the restaurant... In short: you are almost there! I hope you´ll enjoy the visit! 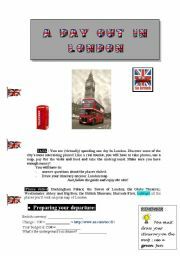 third and last part of a my worksheet : "a day out in London" see part 1 and 2! 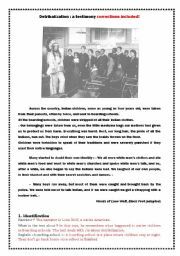 Native Americans and detribalization: corrections included! 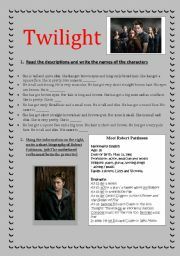 This is the same sheet as the other document I sent a few days ago but with the answers expected from the class included!Grammar : the passive, reported speech, want to, to force/compel/oblige someone to do sthg, used to, interdictions (not be allowed to / be forbidden to) I hope it´s helpful! 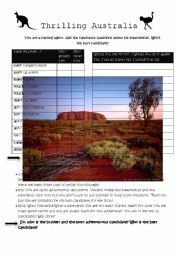 Pair-work: casting for a reality TV show called "Thrilling Australia". 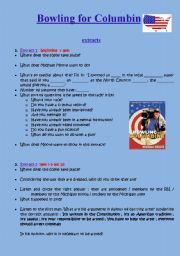 Pupils must use the present perfect (questions and answers) and the conditional.